Starting today’s post with a disclaimer that these bars *technically* have 8 layers, but I’m calling them “7 Layer Bars” since they are still pretty traditional 7 Layer “Magic” Bars. What are the typical Layers in a 7 Layer Bar? So what’s the layer that just HAD to be added to these bars? White chocolate of course! 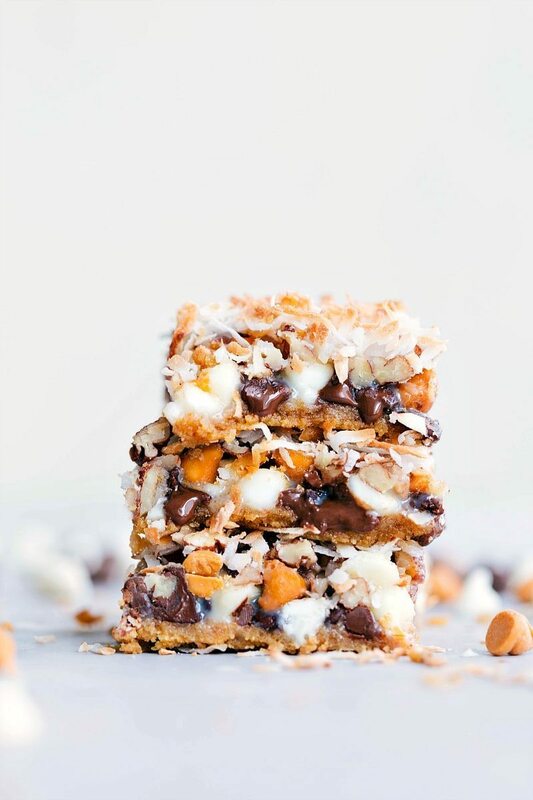 These bars have milk chocolate chips, butterscotch chips, AND white chocolate and they are the best version of any 7 Layer Bar I’ve ever had! “7 Layer Bars” are another treat (her famous carmelitas here) my mom made often growing up — especially around the holidays. We could always expect these around October-November and had probably too many of them (if that’s even a thing…) in December. 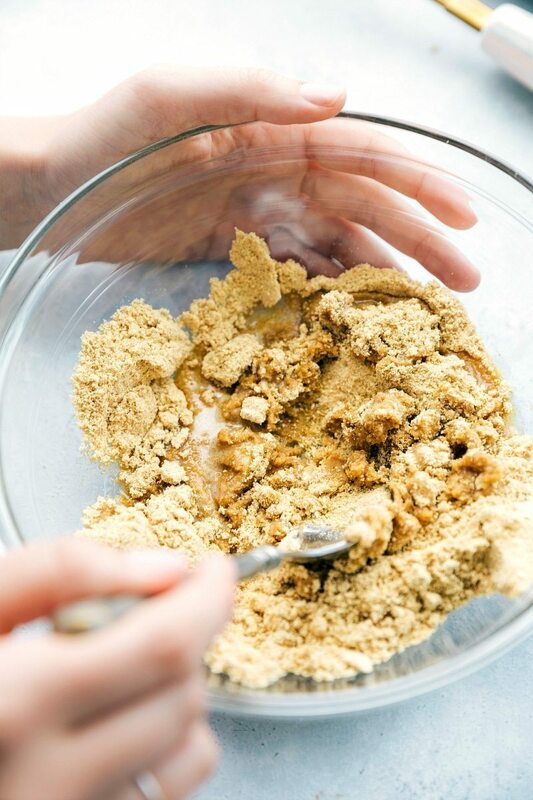 You’ll mix the graham cracker crumbs with a whole delicious stick of melted butter and form the crust right in the pan. And then you just layer up: milk chocolate chips, butterscotch chips, white chocolate chips, pecans, a can of sweetened condensed milk, and finally the last layer: shredded coconut. The reason I put the coconut on top of the sweetened condensed milk (as opposed to underneath it), is because I love the texture and taste of it this way! The coconut gets nice and toasted in the oven and even a tiny bit crunchy. 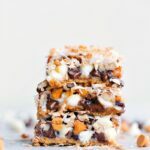 Although it might not be your traditional way to make 7 layer bars, it’s my absolute favorite way to enjoy them! One other great thing about these bars? You get a whole lot of bang for your buck — this recipe fills a 9 x 13 pan, but these bars are SO RICH that you’ll want to cut them pretty small. And if you cut these into small bars, you’ll you get dozens of treats from this recipe (perfect for the holidays!). 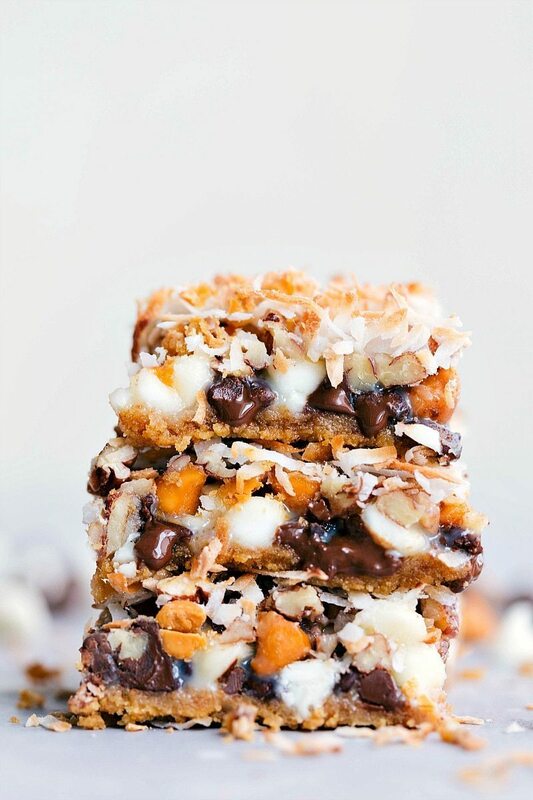 A classic dessert that is always a hit -- 7 Layer Bars with a buttery graham cracker crust, baking chips, and coconut. Preheat oven to 350 degrees F. Line a 9 x 13 pan with parchment paper or foil. Place the graham cracker crumbs in the bottom of the pan and pour the melted butter on top. Mix the crumbs and butter together to form a thick mixture and then press evenly into an even layer at the bottom of the pan. Bake in preheated oven until the edges are golden brown, about 23-25 minutes. 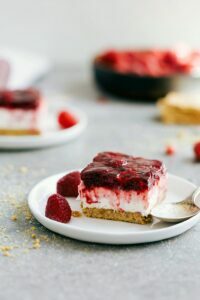 Remove and allow the dessert to cool completely before cutting them into bars.. Seriously LOVE 7-layer bars, but I’ve never made them with white chocolate before. Great idea. Looking forward to trying this. Those look like semisweet chocolate chips to me. You used milk chocolate? Also, do you think it matters about the brand of chips? I have a hard time finding milk chocolate unless it is Ghirardelli. Yes I used milk chocolate 🙂 You can use semi-sweet if you are worried about sweetness! I love Ghiradelli and Guittard, but I think pretty much any chips (Nestle or Hershey’s) are good in these since there are so many chips. hey girl- these bars look so good! 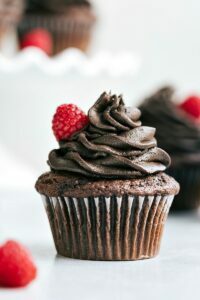 Wow, They look delishhhh! 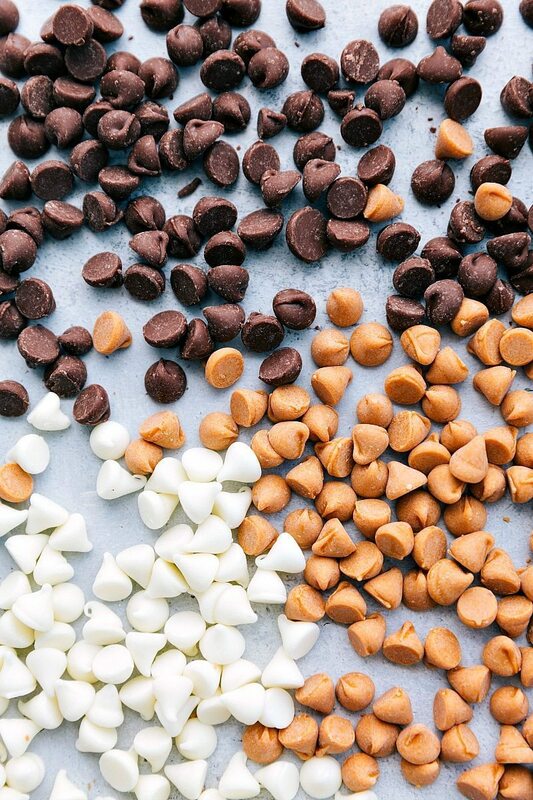 And all the chocolate chips colors … Yum ?? If the pecans (or other nuts) were finely crushed, would the flavor still be there without the chunks to chew? Have some family with dental issues. I think these would still be hard to chew with all of the other ingredients; you might want to try a different dessert entirely. (As a whole these are pretty chewy!) Wish I could be of more help! I always chopped finely and yes the taste is there. I’ve made these 7 layer cookies every Christmas for years as gifts. One friend refers to them as “7 Layer Crack” cookies. 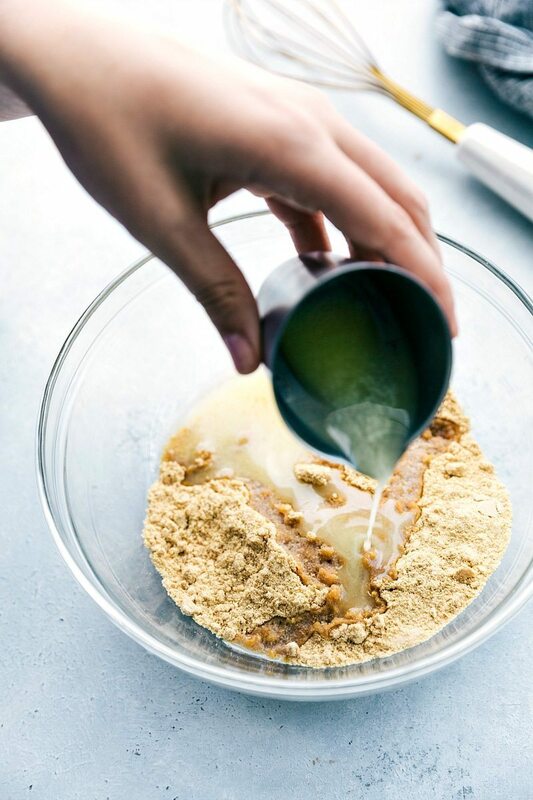 A couple of things I do differently–melt the butter in the pan as the oven heats and then dump the graham cracker crumbs on top–saves a bowl. I also put the nuts on top of the milk. Any way you layer these, they are mighty tasty–and more than a little decadent! My sister has a lot of dental issues as well, she has been on meds for years that has really done a number on her teeth. I use fine chopped nuts (almonds, pecans, walnuts, or the thinly sliced almonds. It depends on what they aren’t sold out of on the type of nuts I choose. She eats them with no problems! They all work geart and taste amazing. Hope this helps. Can these be made ahead of time a be frozen for a week or so? Unfortunately I’ve never tried freezing these bars so I can’t say for sure, but I think it would be ok! My family has made these for years, only they were called Magic Cookie Bars, and did not call for white chocolate chips, just semi-sweet or milk chocolate, and butterscotch. My family has always substituted the butterscotch with more chocolate chips, though. These are my all time favorite bar cookie. I have also used fat free sweetened condensed milk with no problems. Love your site, and look forward to trying out more recipes! You might consider putting the pecans (or walnuts, that’s what I use) as the top layer so you get a toasted nut taste, So much better IMHO. delicious ! Give it a try and see what you think ..
Let me know ok ?? This sounds awesome! I’ll definitely have to give the peanut butter chips a try! I’m excited! They can be a bit tricky to get out! They’re very sticky! Use non stick cooking spray. I use both semi sweet AND milk chocolate, along with butterscotch and white chocolate. 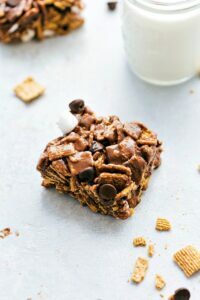 Believe it or not, this chip combo actually makes for a killer chocolate chip cookie as well (I use browned butter which makes for an insanely good cookie). These are so good to eat. My mon used make these all the time. They are so delicious to eat.I Love these bars.